Please join Edinburgh Anarchist Federation in showing your support for SUWN activist Tony Cox who was arrested when trying to accompany a vulnerable woman to her Work Capability Assessment. This case is an attack on our organisation and on welfare activists everywhere. This second court case came to trial on 9th June in Dundee, but had to be adjourned, when the woman who Tony was accompanying when he was arrested broke down in the witness stand. Although the Maximus evidence was riddled with contradictions, we were very aware that there are three of them, so the evidence from the woman Tony was accompanying was really important. She wasn’t called until about 3.30pm after waiting since 9.30 in the morning, and she was clearly completely overwhelmed by the formality of the court. Before Tony’s lawyer had asked any substantial questions she had broken down in tears and was unable to recover enough to continue. Rather than go ahead without key evidence, we had to ask for the case to be adjourned. We hope that when it reconvenes on the 23rd she will feel able to give evidence via video link.There will be protestors outside the court and support protests in other parts of the UK because everyone who is on benefits or who knows people on benefits recognises the vital need for people’s right to be accompanied to be respected. As the benefit system evolves into an increasingly punitive minefield it has never been more important to have support negotiating the way through. The right to that support exists in law. We are insisting it is recognised in practice. No-one should be criminalised for insisting on their rights or helping others to do so. ADVOCACY IS NOT A CRIME. 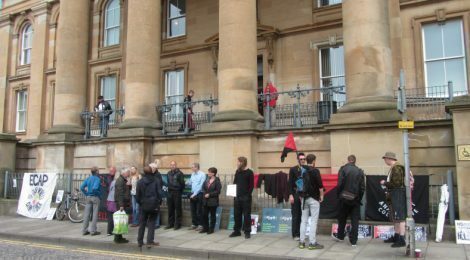 We will be outside Dundee Sheriff Court from 10am on Thursday 23 June.